Click on the photograph or green link below image to read full story. Eaton Fine Art was highlighted in the March issue of Architectural Products, featuring the art curated for Holston House Nashville. 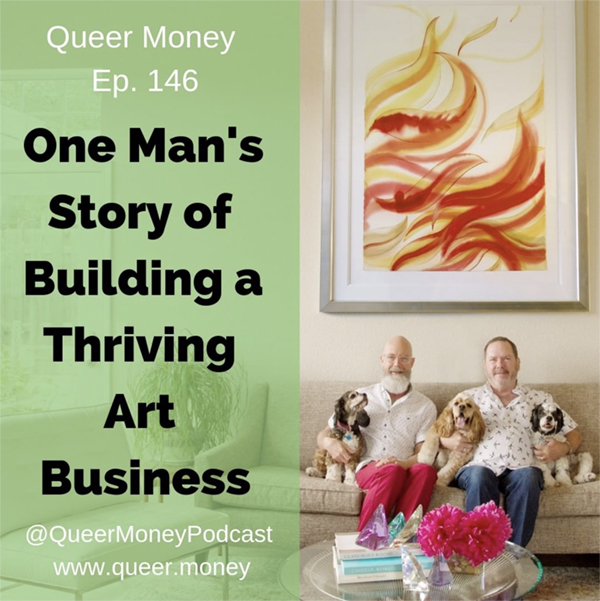 The Queer Money Podcast featured our chief curator and president, Terry Eaton, and dives into his story including how Eaton Fine Art started. Eaton Fine Art was featured on Inspire Design, sharing the inspiration behind the curated art package for The Phoenician, in Scottsdale, AZ. Eaton Fine Art was featured in Hotelier magazine for the curated art package they provided in collaboration with HBA Design for the Fairmont Empress. 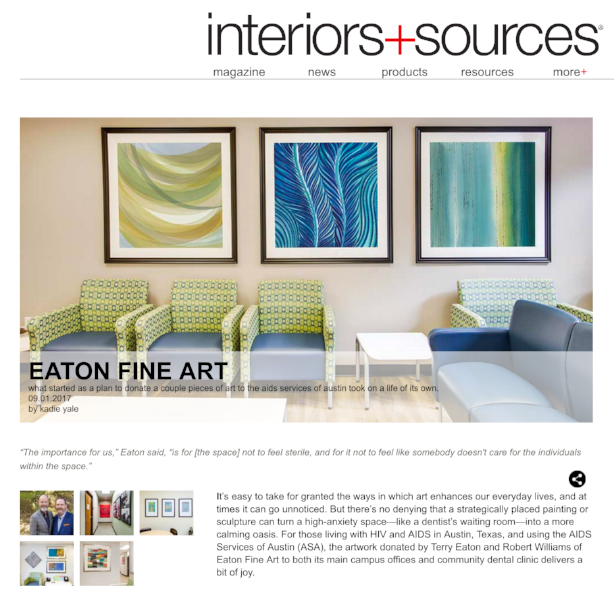 Eaton Fine Art had the honor of donating a curated art program to the newly opened Moody Medical Clinic of Austin. Eaton Fine Art was featured on Healthcare Facilities Today for the curated art program donated to the AIDS Services of Austin’s Moody Medical Clinic. The most recent issue of Sleeper magazine features art curated by Eaton Fine Art in collaboration with Parker Torres Design for the Phoenician Resort. Eaton Fine Art collaborated with Jeffrey Beers International on this graphic mural for the Danlu restaurant in Philadelphia. Eaton Fine Art responds to a Q&A on recent project, Holston House Nashville, providing a closer look at the process and inspiration. Our recent collaboration with Stonehill Taylor, Holston House Nashville, is featured in the latest issue of Hospitality Design. EFA's own Terry Eaton is quoted in an article highlighting high-achieving executives. Termed a "local beacon of luxury," The Phoenician Resort and its desert-inspired art program get a mention in Phoenix Magazine! The latest issue of Boutique Design highlights the custom, commissioned focal sculpture in the newly-renovated Phoenician Resort's main lobby: Solaris. The curated art program at The Phoenician Resort is featured in Arizona Foothills Magazine. Inspire Design magazine spotlights Pantone's 2018 Color of the Year: Ultra Violet, including artwork by Eaton Fine Art. Eaton Fine Art collaborated with Stonehill Taylor on the artwork program at the newly opened Holston House Nashville. Hilton West Palm Beach, one of Eaton Fine Art's recently curated projects, is featured as a "design destination," in Interior Design magazine. "I see the potential for art to make West Palm Beach, Florida, one of the most important cultural hubs in the Southeast," says Gopal Rajegowda, senior VP at Related Companies, who developed the property. Terry Eaton is featured as an industry expert, providing insights into 2018 hotel design trends. What started as a plan to donate a couple pieces of art to the aids services of Austin took on a life of its own. "In the design of commercial interiors, especially hospitality spaces, the curation and placement of fine art is a critical aspect. Eaton Fine Art (EFA) has been a well-regarded art consulting firm for 25 years, working with many leading hoteliers. Terry Eaton founded the company in Austin, Texas, and leads a 12-person operation with his partner Robert Williams. Eaton describes his art selection business, curation collaborations with both designers and owners, and the key highlights of his work." "Terry Eaton and his partner Robert Williams are experts in curating an art program which evokes, enhances, and speaks to that story for hospitality projects." Selecting art for a hospitality setting can be an art itself. Eaton advises designers to be authentic, aware of the narrative and to engage the viewer. In an interview with Hotel Business Design, Eaton shares additional tips, including what’s emerging in the art world and how designers can make bold ideas work in hospitality spaces"